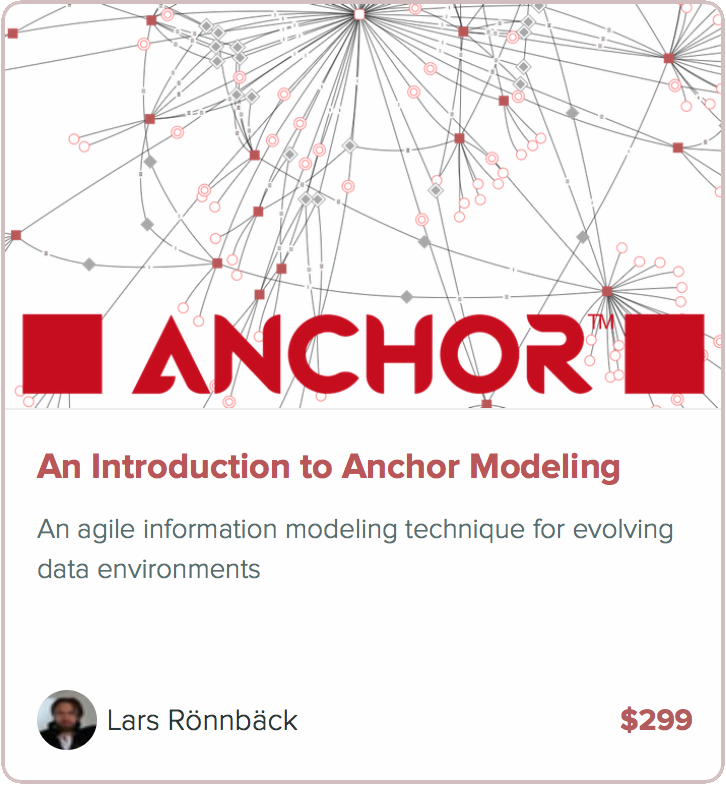 Anchor Modeling is an Open Source database modeling technique built on the premise that the environment surrounding a data warehouse is in constant change. A large change on the outside of the model will result in a small change within. The technique incorporates the natural conecpts of objects, attributes and relationships making it easy to use and understand. It is based on the sixth normal form, resulting in a highly decomposed implementation, which avoids many of the pitfalls associated with traditional database modeling. Thanks to its modular nature the technique supports separation of concerns and simplifies project scoping. You can start small with prototyping and later grow into an enterprise data warehouse without having to redo any of your previous work. Even though its origins were the requirements found in data warehousing it is a generic modeling approach, also suitable for other types of systems. Every change is implemented as an independent non-destructive extension in the existing model. As a result all current applications will remain unaffected. Changes in the input to and output from the database can thereby be handled asynchronously, and all versions of an application can be run against the same evolving database. Any previous version of the database model still exists as a subset within an Anchor Model. A fixed model can rarely survive for any longer periods of time. At some point a change will occur that could not have been foreseen, and if the initial effort was to create an all-encompassing model you may now be facing dramatic alterations to cope with the new situation. Anchor Modeling is built upon the assumption that perfect predictions never can be made. Database models should not be built to last, they should be built to change. Only then can they truly last in an ever changing environment. The Anchor Modeling Technique is free to use. Material published on this site, such as presentations and articles, are subject to the Creative Commons Attribution-ShareAlike License. The Online Modeling Tool is licensed using the MIT License. Models created using the technique with or without the tool are completely free from licenses and can be used in any way the creator of the model desires. We claim no rights whatsoever over the resulting models. We would also like to thank JetBrains for providing us with Open Source licenses of WebStorm, used in the development of the modeling tool.